Which of the above two spellings is correct? Doughnut appears as the official spelling in the dictionaries but donuts is the contracted word of the original mostly used by Americans.What is a doughnut? A doughnut is a small fried cake made from a sweet dough. Its either in the shape of a ball or a ring. The ball shaped doughnuts are usually filled with fresh cream, jam or custard. The ring ones are glazed with icing, chocolate or fresh cream. If they are not glazed then the warm doughnuts are coated with sugar and cinnamon or other flavourings or spices. It is believed that during the mid 19th Century the Dutch were making olykoeks or oil cakes. These were fried in pork fat till they were golden brown. The Dutch settlers in America continued to make these oily cakes and since then have evolved into what we know as present day doughnuts. Whatever the history, it seems that many parts of the world have their own version of a doughnut. Take for example balushahi in India or the vadas, Zeppole in Italy, Churros in the Spanish speaking countries, Beignets in France, Mahamari in East Africa, Yoyos in Tunisia, Sel roti in Nepal just to name a few. 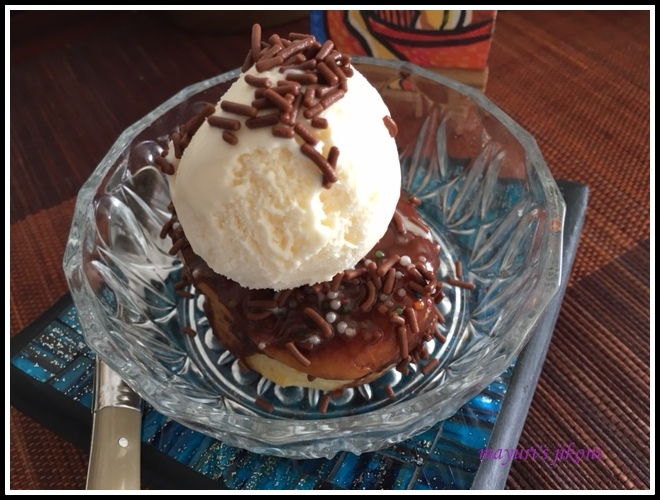 Our 42nd theme on #FoodieMonday #Bloghop is #Kidsdelight. I don’t have any kids around to feed so really am out of touch what kids these days prefer. A few days ago my neighbour’s daughter was pestering her mum to buy her some doughnuts. So the argument between mum and daughter was that the ones available near our home are big, dry and tasteless and a bit expensive. So that’s where I got the idea of making doughnuts. I went through my recipe books and found that I had jotted down twice, a baked version. So a baked version of doughnuts was what I decided to make for this theme. Yes, my neighbour’s daughter was the happiest person on our floor. So without much delay, here is the recipe. P.S. Though my children are adults now, I am sure they would have enjoyed these doughnuts. There’s still a kid in all of us. Sift plain flour and cornflour together in a big bowl. Add sugar, salt, zest and yeast to the flour. Mix well. Add the warm milk and form a shaggy dough using a spatula. Dust the worktop with little flour. Don’t be tempted to use more flour even though the dough will be sticky. Add a cube of butter and start kneading the dough. Keep on adding cube by cube and knead the dough for 5- 7 minutes till its smooth and elastic. Grease the bowl with some butter. Put the dough into the bowl. Cover with a cling film. Let the dough rise till its double the size or for about 1½ hr. Heat cream gently in a pan over low heat. Add the chocolate pieces and stir till the chocolate melts. Add vanilla extract. Mix well. Keep it on the side till required. Knead the risen dough gently. Roll it out into a circle or rectangle. Make sure its about ½” thick. I made mini doughnuts so I used a cutter which is about 2½” in diameter. Cut out the doughnuts. Place them on a parchment lined baking tray. Gather up the extra scrap of dough. Roll it again. Cut doughnuts. Keep on repeating the process till you have used up the dough. Cover the doughnuts with a wet tea towel and let them rise for 20 minutes. When 5 minutes of the rising time is left, switch on the oven and let it heat up at 180°C. Place the tray in the oven and bake for 10 minutes till they are golden brown on top. Remove the tray from the oven and brush the doughnuts with melted butter. Let the doughnuts cool down for 5 minutes. Take a doughnut and dip it into the chocolate glaze. Place it on the tray again. Sprinkle the top with sugar strands. Repeat steps 12-14 till all the doughnuts are glazed. Serve with a cold glass of milk or ice cream for a double treat. I didn’t have a doughnut cutter, so I used a small bowl and a bottle top to cut the middle part. If you have a doughnut pan, use that to bake the doughnuts to cut even shaped doughnuts. You can coat the doughnuts with sugar if you prefer or top it with a glaze of your choice. Doughnut lovers at my place too Di! The doughnuts look tempting and loved the last one with a dollop of ice-cream on top. Thanks much for the baked version! Bookmarking the recipe link. Lovely.. must give it a try. My only problem is there is no one to eat the sweet stuff I make. Thanks Gloria, I too love doughnuts and had them after a very long time. Alka the doughnuts did turn out soft and they are definitely better than the ready made ones as they contain preservatives and are too sugary. Thanks Saswati. Do try them out and let me know if you liked them. Pushpita, the ice cream one tasted just so evil and delicious. Do Bake them and let me know how they turn out. Thanks Nisa. They do taste slightly different from the fried ones. I loved these ones as you don't get the oily taste. Thank you Shibani. Not a great baker but love baking and keep on trying out new things. Same problem here Shobha, so always bake to give away as presents. Lovely Share.You are an awesome baker.